The best roadside couloir in the Cascades? Photo taken from Torment-Forbidden Traverse on September 2, 2007. This was my first trip to the Cascade Pass area. That is, my first successful trip. Jason Hummel and I were going to attempt the couloir a few weeks before, but we were thwarted by a large, fallen old-growth tree across the road eight miles before our destination. What's more, I had not intended to do anything on a Friday during this quarter of school, but I could not resist when I heard Jason Hummel and Ben Manfredi were both thinking of doing something. In the end, I think Jason was obsessed with the couloir, while Ben wasn't too sure about the snow conditions (avy danger). The NWAC forecast was low to moderate, so I was willing to take a look, if nothing else. We reached the second gate, which was closed, just past mile 21. It was raining lightly and the time was five-early in the morning. We were both dealing with dampened motivation, so we took a forty-five minute nap. We awoke to more rain, then Jason showed me some slides: mostly pictures from his trip to Mt Larrabee with Ben the weekend before. 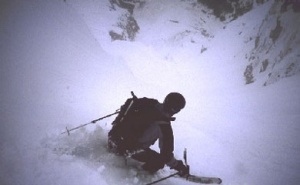 I saw pictures of skiing and climbing in terrible visibility, which looked like all of my recent trips. I promptly nodded my head for another half hour of shut-eye. The next time I awoke, I was beginning to feel bad about sitting there. Jason must have felt that way too, because with a paucity of words we exited Jason's truck and made ready. The rain had changed to snow, which was good, but still not exactly what we hoped to see. After a couple switchbacks up the road, one avalanche-debris crossing, and one crossing of an impressive landslide, I was grateful to take the skis off the heavy pack and ski up the remainder of the road. Being new here, I was a bit worried about passing the spot, but I stopped at the obviously correct place where the road switchbacked within a dozen yards of the creek and an inestimable pile of avalanche debris. The clouds obscured all views of the behemoth above us, so I waited for Jason's assessment. He thought the spot looked correct and the clouds were starting to lift just a little. On the topo it looked like this switchback was indeed the only possibility. Without further ado, we left the skins beside the road and hiked into the void. The clouds opened enough to assure us that we were headed for the correct couloir by the time we reached the base. We stopped below a rock band to retrieve our crampons. We didn't know whether we would need crampons, but we didn't want to stop during the next stretch for any reason. The possibility of big rocks tumbling off the cliffy faces above the couloir, homicidal seracs perched precariously on the Sill glacier, and constant sluffs down all the gullies funnelling into the couloir gave our imaginations plenty to do while we plodded up the steepening snow. Jason sounded like a broken record, reminding me to stay as far to the left as possible. I reassured him that I had heard his admonitions, and let him know he was free to leave my steps and head farther left if he felt the need. Jason took a short turn at the helm when I stalled. Then I took another turn. Then Jason again. This time when I caught him, the clouds finally lifted. We could see that we were nearly above the Sill's firing range; the top of the couloir looked like it was only a stone's above us. I removed my pack to get the camera, telling Jason to make tracks so my 135 mm lens could get some scenery along with him. (It's pretty hilarious I had a 135mm lens with me - a crappy one at that.) I took my time getting everything loaded again, along with a good break for a drink. When I finally caught Jason, the snowpack felt considerably different. I took another turn and it was all I could do to take the smallest step without everything giving way beneath me and putting me lower than before my effort. After a pitiful stretch, Jason took the lead again. Jason took the lead again. I asked him whether he thought his gloves might be useful. He said his hands were fine. I would have never asked that until recently, but I am always thinking about my hands since my frostbite incident. Jason forged a path like a mythological hero. I could barely follow. He scouted the drifts in his circumference for the most consolidated section and kept moving. We could now see the cornice at the col, with a bulge in front of it. Jason found a path that offered a little more stability where debris funneled down a sixty-degree runnel. 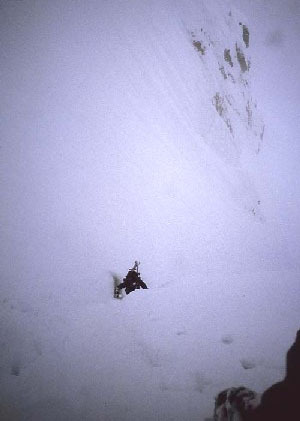 We followed its rectangular trough, but it took us up the side of the couloir instead of over the bulge. I caught Jason, frozen in panic. His hands were on the verge of frostbite from having to plant them in the snow to climb. 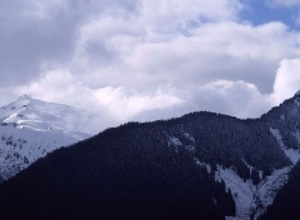 The slope was too steep and insecure for him to remove his pack, much less fetch his gloves from its depths. My hands were toasty in my OR Mutant Mits, so I gave him the shells and pressed ahead wearing only the liners. I followed the next gully to its top, where I was able to traverse to the col. It seemed like I must have been standing on snow accumulated above a cliff. One of my steps went through the snow to reveal the black depths of a moat and confirm this fact. I gave Jason a warning, then took my next few steps gingerly. At last, the col. It wasn't over, but I was happy to be out of the frying pan and into the fire. 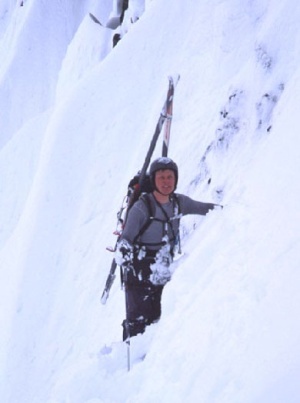 Above the couloir, we had a few words, but overall we were both rather taciturn. We talked about how Ben was right about the unconsolidated snow. I listened to the Blue Oyster Cult in my head, "Don't fear the Reaper." We would be going to the bottom of the couloir soon, the only question was whether we would arrive there in the snow or on the snow. We approached the skier's left side of the col. Jason entered first; a few blocks of snow tumbled down as he went over the roll at the end of the cornice. I joined him momentarily. He was going to take a picture, so I made a jump turn. Here it is, and... nothing but a little four inch slab. Now don't get too comfortable. Don't start banging big turns. Don't ski over into the deeper stuff on the left. And don't look now, but we just might make it. We made our way down the world of avalanche debris that comprises the lower couloir with as much speed as we could muster. I stopped only when my legs burned so badly that injury seemed imminent. Then I started skiing again before they really felt any better. The seracs of the Sill Glacier were a great motivating force. I hiked down the road slowly. After skiing the couloir, I was only now being treated to my first views of unruly Johannesburg. Hanging glaciers above cliffs left me questioning what else could be skied on this untamed beauty. But alas, it was time to relax and admire the patches of blue sky with which the afternoon blessed us. 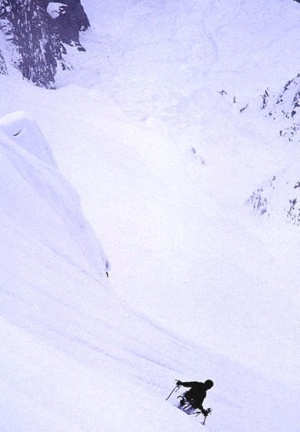 For the first time, firsthand accounts of other descents of CJ Couloir reached my ears in April 2009. Dan Helmstadter made a solo climb and descent of the couloir on 2009.04.23 (cc.com link). The very next day, Jason Hummel and Christy Kinney took advantage of their funemployment to make another descent (Christy's story on Jason's site). I'd love to hear from others about this classic line!